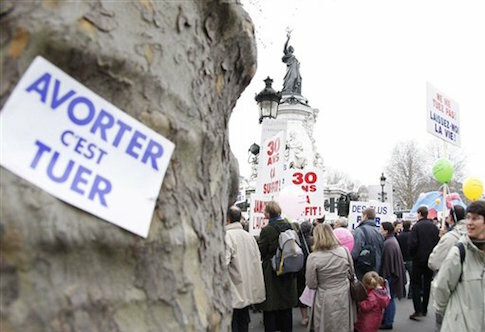 The French Senate adopted a bill that will make it a crime to post pro-life information on the internet on Wednesday. The Senate voted 173-126 to approve legislation that will make it a crime for any website to publish material at odds with the nation's abortion regime. The legislation, which passed the French National Assembly on Dec. 1, will prosecute pro-life activists for "exercising, by any mean, moral and psychological pressures, threats or any act of intimidation against people seeking information on a voluntarily termination of pregnancy." Sen. Francoise Laborde, a member of France's Radical Party of the Left, said during debate that pro-life websites constituted "horrors and lies" and should be prevented from operating. The bill targets those who operate pro-life websites or provide information about abortion alternatives. Violators will face up to two years in prison and $30,000 in fines. The Senate approved an amendment that appears to soften the ban by removing "in a dissuasive aim" from the text of the Assembly bill. On paper, that amendment will punish "misinformation," while allowing pro-life activists to attempt to persuade women against abortion. Grégor Puppinck said the Senate bill "is better writing, but not better substance." It will do little to protect the free speech rights of pro-life activists because the amended language continues to bar "moral and psychological pressure," a vague term that leaves pro-lifers vulnerable to accusations from pro-abortion activists. "Publishing the Christian teaching that abortion is a crime could be seen as putting pressure on people," he said. "The simple sharing of information that might upset moral conscience could be sufficient to constitute a crime." Puppinck is the director of the European Centre for Law and Justice. He said that the wording of the law could extend from explicitly pro-life activist groups and websites and eventually include entire religions. The Catechism of the Catholic Church, the guiding document for France's largest religion, calls abortion a "moral evil," adding that "this teaching has not changed and remains unchangeable." Since the Catholic clergy in France cannot change the teaching, they would have to remain silent on the subject or face penalties for communicating its position that abortion is "gravely contrary to the moral law." "This law may prohibit the church from publishing its position on abortion. If you teach that it is a sin then teaching itself would be sufficient for prosecution," he said. The Senate and National Assembly will now enter a process to reconcile the original and amended bills. The National Assembly will have the final decision on which bill to advance to Socialist President François Hollande—a vote that is expected to occur in the coming weeks. Pro-life activists intend to take the matter to France and the European Union's highest courts if necessary. A coalition of 60 lawmakers who voted against the bill can ask France's Constitutional Council to rule on the matter before Hollande, whose party championed the bill, can sign it. If that effort is not successful, Puppinck says that the European Centre for Law and Justice will take the case to the European Court of Human Rights. He said that the court should follow in the footsteps of the United States Supreme Court, which unanimously struck down a law that prevented pro-lifers demonstrating outside of abortion clinic sidewalks in 2014. "It's a real limitation on free speech aimed at mainstreaming abortion," Puppinck said. "We expect that this court, like the U.S. Supreme Court, will support freedom of speech and recognize that abortion is a public issue that has to be debated freely." Dr. Joseph Meaney, director of international coordination for the pro-life Human Life International, has been working in France over the course of the debate. He said that the Assembly and the Senate are attempting to limit the information that women debating abortion receive. The criminal penalties associated with espousing pro-life views, he said, were some of the most extreme actions taken by the abortion lobby. "The main concern expressed was that women seeking abortion not be confronted with any pro-life information," he said. "They are willing to make it a crime to have a pro-life website that seeks to help women not to abort."